Foreign Minister Osman Saleh Mohammed and his Hungarian counterpart Péter Szijjártó signed an Intergovernmental Economic and Technical Cooperation Framework Agreement. Eritrea and Hungary today signed a Framework Agreement to enhance bilateral cooperation. 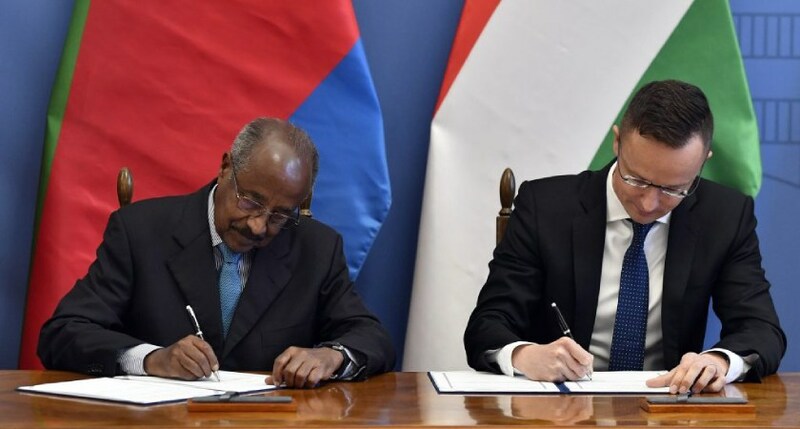 The signing was done in Budapest where Eritrean delegation composed of Foreign Minister Osman Saleh and Presidential Adviser Yemane Ghebreab are on a three-day working visit to that country. During the bilateral meeting that preceded the signing of the agreement, Hungarian Foreign Minister, Mr. Peter Szijjarto congratulated Eritrea for the peace agreement signed with Ethiopia and stated that the new developments will create very conducive environment for enhanced cooperation. During its stay in Budapest the Eritrean delegation will meet other officials and business community. The policies of Brussels that handle migration as a given fact, and even encourage it, present a danger to Europe and they are harmful to Africa, Foreign Minister Péter Szijjártó said on Tuesday. After talks with Osman Saleh Mohammed, the foreign minister of Eritrea, Szijjártó told a joint press conference that Africa needed peace, security and economic development in order to retain its population. 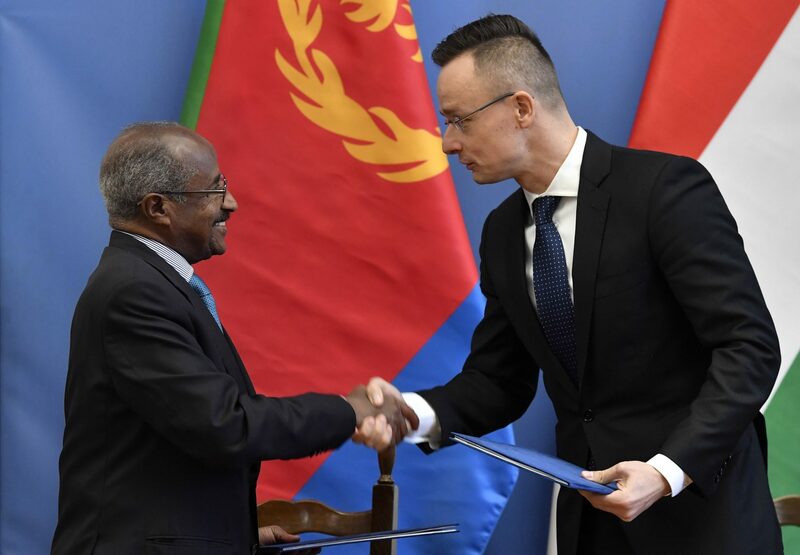 In order to help economic development in Eritrea, Hungary supported the lifting of European Union sanctions against the country last year, Szijjártó said. Additionally, Hungary made it clear in the UN Human Rights Council that it appreciated efforts by Eritrea to guarantee human rights, he said. Neither Hungary nor Eritrea supports the UN Global Compact for Migration, which fails to make a distinction between illegal migrants and refugees, he added. The UN is trying to bring back the migration compact that more than forty member states had rejected, he said. Eritrea had a long-lasting conflict with Ethiopia but the two countries started a process of reconciliation, which has resulted in significant progress in regional stability. Africa’s stability is important for Europe and therefore Hungary has always supported this process, Szijjártó said. Earlier the ministers signed an intergovernmental economic and technical cooperation agreement. Hungary has offered university scholarships for ten students from Eritrea and talks are under way about a tied aid credit scheme for the construction of a cancer diagnostics centre in Eritrea, Szijjártó said. The Eritrean foreign minister said he wanted Africans to stay in their homelands rather than being invited to Europe. He said African and European countries could complement each other and their cooperation could be mutually beneficial. Eritrea is in an important geopolitical situation, which offers many opportunities for cooperation with other countries, he added. In response to a question, Szijjártó said there were attempts to make people believe that the pressure of migration was over but the figures did not support this. “The pressure of migration is here with us” and it is therefore important for Africa and Europe to cooperate, he said.